After spending 2 nights in Jeju, we took a noon flight back to Seoul! YAY! Can’t wait for our shopping and cafes hunting again! We touched down Gimpo Airport around 12.20pm and took the subway back to Yeoksam station and check in back to Tria Hotel. This time, I booked a Royal Deluxe Double Room which is a bigger room compared to the previous standard room we stayed. With Jacuzzi Bathtub but we didn’t use it at all! After settled down our baggage in the room, we have to quickly rush to Myeongdong for our late lunch and our hair appointment at Juno Hair! Finally we reached Myeongdong, we have been craving for Bongchu Jjimdak(봉추찜닭) and wanted to eat so badly! But both of us don’t remember where’s the exact location of Bongchu Jjimdak(봉추찜닭) restaurant! Keep walking round and round but still couldn’t find it. We were mad hungry and desperately need to eat Bongchu Jjimdak(봉추찜닭)!! Got no choice, I have to approach the mobile tourist guide in Myeongdong and she direct us the way to Bongchu Jjimdak(봉추찜닭)! I have recommended this dish in my Plan Your Trip to Korea [Part 4] Myeong-dong! post! It’s a must-try food when you go Korea!! You will definitely come back for more! After our yummy late lunch, we headed to Juno Hair, Myeongdong outlet for our hair appointment! Although it wasn’t my first time patron Juno Hair, but it was my first time perming my hair! 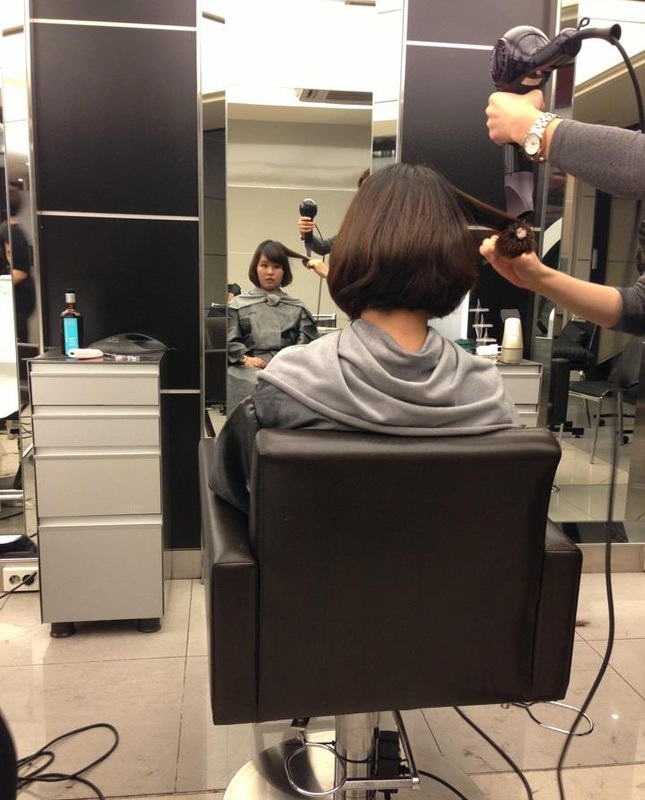 My previous trip, I went to Juno Hair for Wash & Blow service. This time, I’m gonna do a full perm service, so excited! When we stepped into Juno Hair, the service crew will assist us by putting our belongings into the lockers and put on the robe for us to get ready for the hair service. 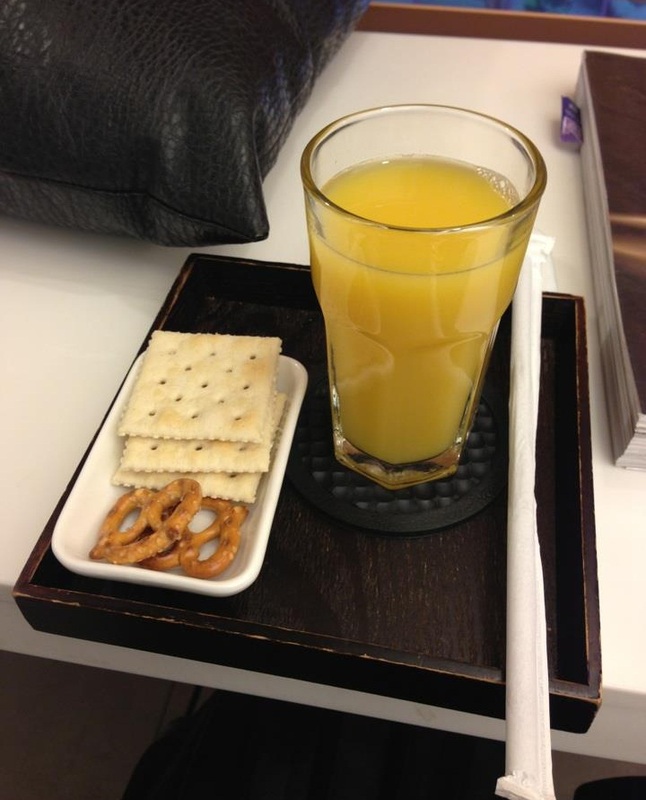 While waiting for the stylist, they will serve you drinks and some snacks. You can choose the drink of your choice from the menu. The stylist came with an ipad with full of pictures, from there you pick a hair style you like and they will do it for you. It’s quite popular for Korean girls to perm their hair and I decided to give it try. Perming Service and Hair Treatment regardless of length cost me 380,000won!! That’s very expensive!! Anyway, I have already settled inside the salon, I got to give it a try and have a change in my look. Juno Hair is a well-known hair salon chain in Korea, you can find Juno Hair almost everywhere. They have 2 outlets in Myeongdong, the outlet we went was on the 3rd Storey building. The staff were quite attentive and nice, they will chit-chat with you and occasionally ask you wanna have more drinks or are you hungry? If yes, they can get you some yogurt..
We spent around 3 hours there, my BFF took this picture while waiting for me.. Blowing my hair for the finishing look! Frankly speaking, I wasn’t very satisfied with my new perm hair. I find myself looking rather old in perm hair. Weather in Singapore doesn’t suit perm hair at all, too humid cause my curl hair look messy! I kept my perm hair for 1 month when I back to SG and straighten it back a month later. Overall it’s a good excellent service experience, I will be back for Wash & Blow service next time I hit Seoul again..
After our hair appointment, its shopping time! Remember on my Day 2 at Myeongdong, SPAO was closed? I wanted to drop by again and hopefully it’s open on that day! And YAY! It’s open! Pictures snapping time!! Super Junior! I suppose to go back to Seoul in this Spring, but due to the conflict between North Korea & South Korea, plus N Korea has declared state of war with S Korea, I decided to cancel my trip. Next post: We going to Petite France & Nami Island! Stay Tune! I Love Checked Nails!! Plus Sha-Nail Art Promotion!! the blogger lovers however this post is really a pleasant paragraph, keep it up. Love reading ur blog post. I will be going Seoul in June. Thinking whether to visit Nami Island. Hope to see ur blog post on it really soon. Thx u.
Hi, how much was the wash and blow at Juno?